The Modern community is ruthless in its dismissal of new decks. When one hits the scene (and one frequently does), pundits invariably point out instances of tension on paper: these cards can’t possibly work together, the sentiment goes. And yet, the deck placed high enough to draw that attention in the first place. Tension is as oft-misunderstood a Magic concept as tempo. In this article, I’ll define the term and argue for its overlooked beneficial role in deck composition: taking advantage of an untapped resource. What is tension? Well, let’s start by defining what isn’t tension. The opposite of tension is synergy, or the cooperation of multiple distinct parts to form a combined effect greater than the raw sum of its parts. Taken to its logical extreme, the ultimate example of synergy is just combo: attacking opponents for millions of damage sure beats the individual effects of Deceiver Exarch or Splinter Twin. Working down the spectrum, currently-legal synergy combos include Vizier of Remedies with Devoted Druid (which together yield unlimited mana) and Vizier with Kitchen Finks and a sacrifice outlet (unlimited life). As we move deeper into fair territory, infinite combos disappear to make way for micro-synergies, or small, favorable interactions between cards that snowball into tangible advantage down the road. Micro-synergies are defined by groups of cards that work towards the same goal. Think Street Wraith, Mishra’s Bauble, Tarmogoyf, and Traverse the Ulvenwald—a set of cards which, together, yield a product more powerful than the mana spent on them might suggest. No fair deck in Modern lays claim to more micro-synergies than Traverse Shadow, a strategy that leverages these small advantages to at once be highly proactive, highly interactive, and highly consistent. All the pieces here work together. For instance, Mishra’s Bauble is more of a delirium enabler than a Death’s Shadow buff. Still, it offers scrying with fetchlands, which feed the Shadow; adds information for Thoughtseize, the Avatar’s other compatriot; and turns Street Wraith, the final piece of the Shadow core, into Opt. Similarly, Temur Battle Rage is here to get over impossible boards and one-shot opponents with a huge Shadow. But it’s also happy to target Tarmogoyf, which grows up to 6/7 in this build. By now, Traverse Shadow has decisively been reigned in. 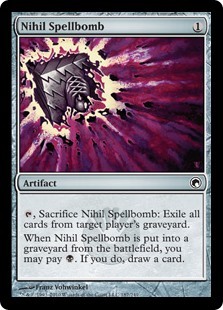 The deck’s emphasis on micro-synergies makes it vulnerable to hosers that invalidate those synergies, especially graveyard hate like Rest in Peace and Nihil Spellbomb, despite that same focus generating a terrifying deck when left unchecked. In this way, Traverse Shadow has much in common with Affinity, a decidedly less interactive, but far more proactive, aggro-combo deck. Affinity has so much built-in synergy that nearly any hand featuring Mox Opal is sure to be excellent, but hosers like Stony Silence shut the deck down almost entirely. With synergy defined, we can move on to tension. Tension is the strain resulting from ill-fitting pieces being jammed together. Magic players often refer to instances of tension as “non-bos” (cf. “combos”). Such instances include playing Snapcaster Mage in the same deck as delve creatures, or Chalice of the Void alongside Expedition Map. But as we’ll see, tension isn’t inherently bad. After all, decks running those combinations exist and perform. A key skill in Modern deckbuilding is to identify where decks can afford some tension, and to introduce it accordingly to achieve some other goal. Most of the time, that goal is diversifying angles of attack. There are two types of diversified attacks: ones that skirt opposing interaction, and ones that force opponents to have different types of interaction. Back to Traverse Shadow. Its namesake threat, Death’s Shadow, notably doesn’t care about graveyard hate at all, making it an elegant line of attack against opponents packing hosers—the 13/13 ignores that type of interaction. Unfortunately for Shadow, though, the deck only gets to play four copies of the creature, leading it to rely on Traverse the Ulvenwald to search out more. As such, graveyard hate still cripples many Traverse Shadow lines, and the deck’s Shadow plan doesn’t offer enough coverage to fully insulate the deck against hosers. Traverse Shadow still finds itself relatively centered on the spectrum of “folding to grave hate,” and around the same notch as Storm. On the very end, we have Dredge, a deck that very rarely beats a Rest in Peace. Consider this makeshift table on graveyard reliance among certain Modern decks. This table is by no means comprehensive or accurately scaled. So far, I’ve primarily focused on graveyard reliance to illustrate synergy and tension, but these two principles operate on many axes: converted mana cost clumping and curving; gameplan sharing; hand size and other resources. In terms of hand size, for example, Jace, the Mind Sculptor (whose +0 rewards players for accumulating many cards in hand) and Liliana of the Veil (whose +1 rewards them for going hellbent) have tension when played together. Graveyard reliance is just one of the easiest axes to visualize, so we’ll stick with this example for the duration of this article. In the table, my method for differentiating between graveyard-reliant and non-reliant decks was simple: non-reliant decks get to splash heavy-duty hosers like Relic of Progenitus and Rest in Peace; reliant ones do not. All the way on the left, such hosers become attractive sideboard and even mainboard options. Moving closer to the middle and beyond, decks begin to abandon them in favor of more surgical answers (such as literally Surgical Extraction). One deck I want to focus on is Hollow One, which has been putting up impressive results online. Rest in Peace does indeed stop the deck’s Bloodghasts, Flamewake Phoenixes, and Gurmag Anglers. But it does nothing against Anglers that have already resolved, nor against Flameblade Adept or Hollow One itself. And since these threats come down so quickly, tapping out on turn two for a do-nothing enchantment could spell doom for Hollow One’s opponent. While having threats that don’t care about the graveyard (i.e. Death’s Shadow) is nice, ones that can consistency apply pressure through graveyard hate, and occasionally blank graveyard hate by virtue of their sheer proactiveness, gives Hollow One a very solid plan against hosers. Hollow One and Flameblade Adept let the deck attack from a different angle than Bloodghast and Flamewake Phoenix in both ways. As mentioned, they utilize a different resource—cards discarded, as opposed to the graveyard. That way, graveyard hosers don’t single-handedly defeat the deck. But they also perform different roles, and therefore demand different answers. The former pair goes tall, and fast, demanding heavy-duty spot removal. The latter pair attacks over or around defenders and laughs in the face of that same removal. Anger of the Gods and Surgical Extraction look pretty silly against a pair of on-board 4/4s, just as Ancient Grudge looks silly against everything besides Hollow One. Hollow One’s proactive gameplans attack from enough different angles at once to give most interactive decks a headache. Of course, this boon does come at a cost. The deck isn’t as interactive or as reliable at assembling its gameplan as Traverse Shadow. And although its Goblin Lore-fueled consistency engine meshes well with grave-related creatures, it’s still possible to draw the “Bloodghast half” of the deck when requiring the “Hollow One half,” or to discard critical threats to a Lore and be left with more useless air. Granted, Hollow One does an admirable job of mitigating these tensions, but they do exist to some degree. 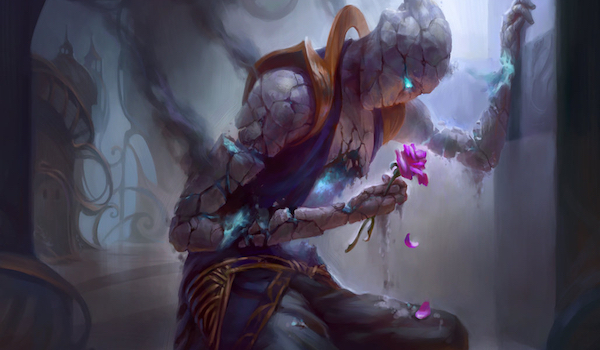 A few weeks ago, I published “Unlikely Gifts: Brewing with Precognition Field,” an article containing multiple decks with the Dominaria newcomer. Around the time I brewed those decks, all of which feature Manamorphose, I tried another Manamorphose deck that mashed together a heap of proven Modern engines, Yu-Gi-Oh! style. This deck re-vamped my old Mardu Shadow deck to accommodate Hollow One. The idea behind this deck was to attack opponents from many different angles at once, forcing them to present diverse answers and nullifying their hate. I figured the Hollow One and Shadow engines share Street Wraith, and Hollow’s one-mana looting spells quickly fill the graveyard for Reveler. The Devil also shines alongside targeted discard, which compliments Shadow and protects Hollow One from Kolaghan’s Command. Avatars; and I cut Young Pyromancer from Mardu Pyromancer, preserving instead Lingering Souls for token assaults from the sideboard and Bedlam Reveler as a way to abuse the graveyard and defeat grindy decks. (Death’s Shadow already forces opponents to keep Fatal Push against us, and I’ve never much liked Pyromancer). Of course, the deck was a failure. I found in testing that Hollow One requires more than just eight looting spells to be reliable. Wraith also does nothing for Bedlam Reveler without specifically Traverse the Ulvenwald in the mix. I encountered plenty of awkward draws with, say, one of each threat and no way to cast any of them. My failed experiment notwithstanding, deliberately introducing tension into a deck sometimes improves it—if that tension is minimal compared to the benefits of attacking from a unique angle, for instance. After all, some decks do play Snapcaster Mage and delve threats together. And in my Queller-Cat deck from a month ago, I found Rest in Peace invaluable out of the sideboard, despite the deck’s packing 4 Tarmogoyf. The biggest reason to divest from synergy in Modern, though, is the utter power of the format’s spells. If a UR deck doesn’t utilize the graveyard at all, but can properly wield the likes of Snapcaster Mage or Bedlam Reveler, it should certainly do so. This example in particular is quietly reshaping the metagame as we speak; we’re starting to see the UR Pyromancer decks from Pro Tour Rivals of Ixalan foresake non-Thing in the Ice creatures for the grave-hungry Bedlam Reveler and even Pyromancer Ascension. 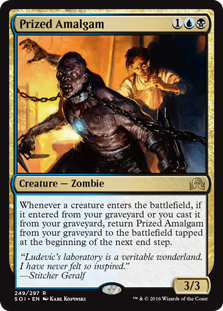 And the same principle holds for other decks: Modern contains so many incredible grave-based cards that it’s generally correct to find a way to utilize that resource, even if doing so takes the form of running heavy-duty graveyard hosers instead. Deckbuilders have much to gain in learning both when tension is acceptable and how much is too much. As always, my advice to these would-be scholars is to experiment and find out firsthand why certain combinations work or don’t. To those of you who do, Godspeed, and may you steer clear of Value Town! Interesting article, and good timing for me. 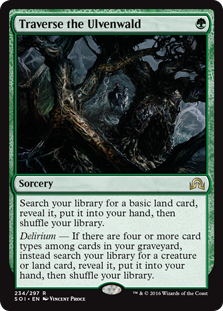 Recently the 5c Humans have been running Reclamation Sage in the sideboard. This seemed like a good tension in deckbuilding that shores up some tough spots for Humans.